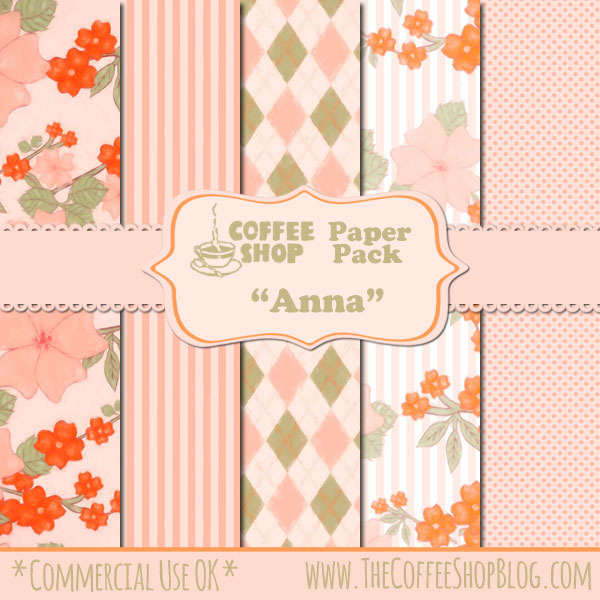 The CoffeeShop Blog: CoffeeShop "Anna" Digital Paper Pack! CoffeeShop "Anna" Digital Paper Pack! I created a new digital paper pack this weekend which I wanted to share with you today. I used this flower image and this paper image to create some really pretty "painted" digital paper. The striped flower paper, second from the right, reminds me of a set of my bedsheets from my childhood. These papers can be used personally or commercially, no attribution necessary. I just ask that you don't sale them as-is. Download the CoffeeShop "Anna" Digital paper pack. You can also download it here. Wow it is incredible how adding a colour adjustment layer and some filters can change an existing image. You've made them so soft and pretty. Thank you. I wish I could afford those Topaz filters! You can do so much with them!!!! Also thanks for the link to the original artist. She has some really great images. If you are looking for some great templates for free, be sure to check out Pixel Scrapper (www.pixelscrapper.com) if you haven't already. It is a designer's dream for resources. You get download credits each day and get to choose the license you want--PUO or CU or of course you can become a Patron and get unlimited resources for a fee.